The $12billion project could attract huge traffic volumes, which would be more than 100 million passengers per year, close to that of the busiest airport in the world, Hartsfield-Jackson International Airport in Atlanta. Nicknamed “the Starfish” by Chinese media, the new airport will have five concourses spiralling out of the primary hall. Five traditional Chinese gardens will be built at the edge of each line where passengers can wait for their flights. Rising out of farmland about 30 miles south of central Beijing, the new transport hub is a testament to the growth in civil aviation in China - which is expected to overtake the United States as the largest market in the early- or mid-2020s - and the government’s vision to develop its industrial north through infrastructure investment. 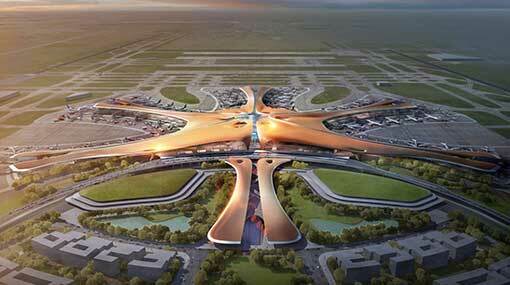 Construction of the airport began in 2014 and rises from farmland 30 miles south of Beijing. The airport is in sync with Xi Jinping’s plan to overtake the United States as the largest market by early- or mid-2020s.